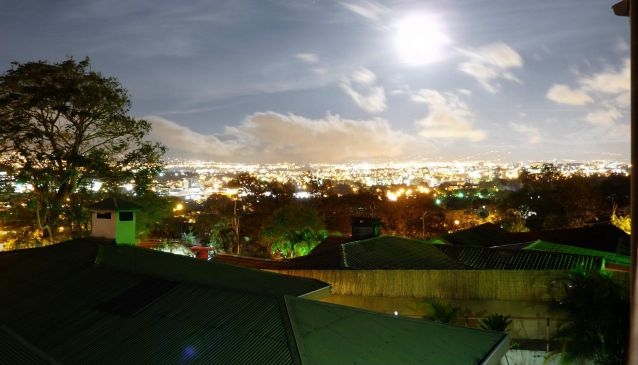 Out of Bounds Boutique Hotel and Tourist Center is nestled in the Escazu Mountains on a beautiful lot overlooking the Central Valley with an amazing view of Volcanoes Irazu, Barva and Poas. Upon arrival to Out Of Bounds they will provide you with a hot cup of gourmet Costa Rican coffee or a nice refreshing fruit drink. A welcoming gift from the hotel. Only 20 minutes from the Juan Santamaria International Airport, they are conveniently located on the Old Road to Santa Ana in the suburb of San Rafael Escazu. The hotel is within walking distance to the international shopping mall, Multiplaza, and in close proximity of Cima Hospital. If you're trip os business related the hotel is just 5 minutes from Forum and 7 minutes from Office Centro. Directly in front of the property is a public bus stop. It's ideal location allows the guests close proximity to amenities such as World Gym and three great Golf Courses. There are numerous excellent Restaurants in the vicinity. Across the street from Out Of Bounds there is the Taj Mahal Indian Restaurant. Within walking distance, you will find a wide range of choices including Chinese, Italian and Peruvian Restaurants. The hotel also has a full tour company and they will take care of every little detail of your trip for you. From arranging airport pick-up, transportation, and suitable accommodations fit to your budget to organizing a variety of tours and packages, you can leave your entire vacation to the friendly staff. Stop by the Information center for expert advice and recommendations. To ensure the best service is given, its owners operate the business daily. Meranda (Canadian) and Matteo (Italian - Costa Rican) believe in warm hospitality and excellent customer care. Each room is tastefully decorated with local artisan work, hardwood floors and comfortable bedding for maximum enjoyment while staying at Out Of Bounds. Your free daily breakfast will include either a typical Costa Rican breakfast. 'gallo pinto' eggs, toast, coffee and juice. Or an American style breakfast with eggs, toast, hash browns, bacon, coffee and juice. Or choose the continental breakfast with Cereal, fresh fruit, coffee and juice. Let us know if you are here for dental work so we can provide you with the special menu that we offer. Breakfast is served from 7:30am to 10:30am on the Terrace.